The Dream Queen hosta has a slightly different look from many of its cousins. You’ll immediately notice its smaller leaves. It also has a more rounded, fuller look than some other varieties. These plants grow to a height between 18 and 24 inches and a width of 24 to 30 inches. The foliage has a different color pattern, too. Blue-green leaves are accented by a yellow stripe down the center. 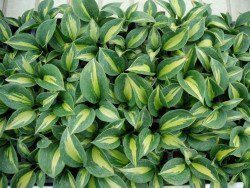 But for all these differences, Dream Queen has many things in common with other hosta varieties. You’ll get white blooms from June to September that attract both butterflies and hummingbirds.